Our beautiful Tudor Northolt Barn offers the perfect location to hire for children and adult parties and celebrations. 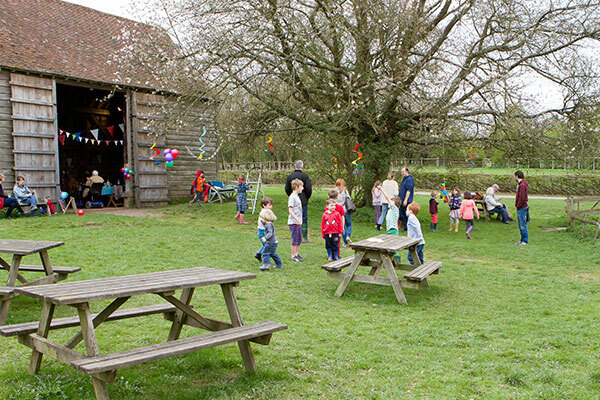 Your party can enjoy the exclusive use of our fantastic historic barn and the green space surrounding it, and you and your guests can enjoy the rest of the day exploring the Museum if you wish. Hire of Northolt Barn includes the exclusive use of the rustic tables and benches within the barn, seating a maximum of 48 people. *prices apply to functions held during Museum opening hours. Subject to availability it may be possible to extend the duration of your event, but additional charges will apply. Evening hire rates are applicable from 5pm, so if your event is to be held mostly outside of opening hours, please see here for more information. We can also offer a unique childrens’ party venue in the form of our rebuilt WWII Nissen Hut. This simple historic building is available for exclusive use for lunch or other party activities, with tables and chairs for up to 30 guests. This venue may be hired for £50 per hour on top of a group admission fee (details of group admission pricing may be found here) and is only available during Museum opening hours. To check party availability and book please contact weddings@coam.org.uk or call 01494 871 117.